Places can only be refunded if the place is filled by another participant. We’re delighted to be able to offer this course at Halsway to complement the popular 2.5 row courses that Emmanuel Pariselle has been running here since 2016. Emmanuel is one of Europe’s finest instrument makers and his courses – with places limited to 10 – usually sell-out well in advance. Emmanuel will guide novice makers through the steps to build your own one-row melodeon. Whilst having a great sense of humour (and extremely good English) Emmanuel is also a demanding task master and will ensure that all instruments made are of the highest possible calibre. In addition to having a wonderful instrument, you’ll also benefit from the inestimable experience of working with a master craftsman and learn techniques for construction, maintenance and repair in the future. The box you build will reflect your individual preferences and there is flexibility in terms of key, inlay, pads etc. Case wood is American black walnut (please note the photo above is one of Emmanuel’s in French Walnut) and reeds are high quality Binci a mano hand-made Italian reeds. You’ll be building a one row in American black walnut with 10 metal buttons on the right, tuning LMMP (with possibility of tremollo between the 2MM), 4 stops on the top of the box, 2 buttons bass and chord on the left, plus air button. Pads can be in American walnut or golden pads, you have a choice of key and layout (D, C, etc), inlay (see www.marechaux.fr). One shoulder strap (or none), thumb strap, and a good quality gig bag are included. Usual keys are D (quebec, Irish, cajun) and C (Cajun); Bb, A, G are a bit low and Eb, E, F a bit high…. This is an intensive course and you’ll be working long days, but Halsway is an excellent venue, secluded and peaceful enough to free you from distractions, but with superb facilities and a bar on site. Accommodation and all meals (and as much tea and coffee as you can drink!) are included, so all you need to think about is the build – and maybe winding down in the evening with a session or two (bring instruments!). No previous experience required, although manual dexterity and basic woodworking skills are an advantage. All tools are provided, but it is helpful if participants can bring a few basic hand tools eg screwdrivers, craft knife, pliers etc. Emmanuel is experienced in working with novice makers, and Mikas Dominas and Chris Mash will both be on hand to offer practical support and to make sure all builds are kept on track. Tuning is done on site by industry expert Theo Gibb. 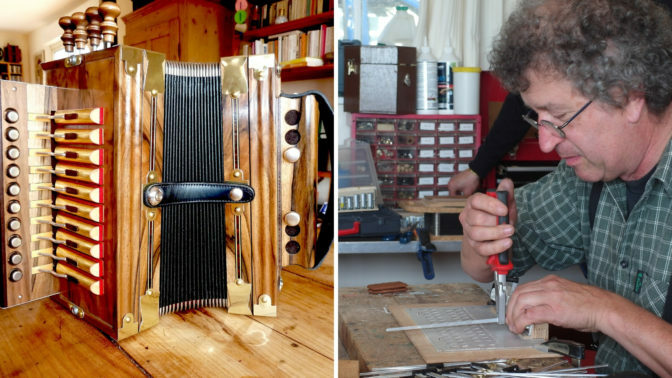 Emmanuel Pariselle has run melodeon building courses across the globe as well as in his native France; musicians including Andy Cutting and Mairtin O’Connor have designed and built their own instruments with him in recent years. Emmanuel himself is a wonderful musician with a mastery of many styles and instruments, and a fine singer too. Ryan Baker will be joining us from Newfoundland; Ryan’s a very good one-row player, and is studying with a view to make his own instruments later. He will be helping Emmanuel in preparation for the course and assisting during the week. Theo Gibb runs The Box Place, offering a repair, restoration and tuning service for melodeons and concertinas. The quality of his work is second to none, with countless delighted customers to recommend him. Theo has played melodeon since 1995, playing for ceilidh/barn dances, clog, and Morris. When not at the day job, he can be found playing with Sunniside Up! Ceilidh Band and chatting about all things squeezebox on melodeon.net and concertina.net. Chris Mash has assisted Emmanuel on previous courses giving practical hands-on support to students at every stage of their build, and ensuring no one drops behind.